For those recovering from foot injuries such as; breaks, sprains, amputations, surgery, or ulcers rely on a Knee Walker with Steering and/or the iWalk2.0 abilities to assist with everyday mobility. We hear this from our customers all the time. Crutches hurt. They’re hard to walk in. Navigating stairs is dangerous. Underarms get bruised and rubbed raw. Arms and shoulders fatigue. But most of all, crutches fall short because they don’t allow you to use your hands. iWALK2.0 is a hands free crutch substitute. It’s a first of its kind mobility device that frees you from the limitations of conventional crutches. Just as our name implies, iWALK2.0 allows you walk with your hands free, allowing you to live a normal and active life that would be impossible with conventional crutches. For most people suffering lower leg, foot and ankle injuries, the answer is YES! iWALK2.0 is a great way to improve your qualify of life during your rehabilitation. That said, since every physique and every injury is unique, we recommend that you always consult with your health care professional before using the iWALK2.0. We are the best crutch alternative (no, we aren't just bragging) because the iWALK 2.0 makes it possible to do things like walking the dog, cooking, making copies, opening a door – simple tasks that take on a whole new level of difficulty when you use conventional crutches. With iWALK 2.0 as your crutch alternative, you can live the lifestyle you did before your injury. With iWALK 2.0 as your crutch alternative, you don't have to adjust your lifestyle for weeks or months as your injury heals. Instead, you can simply continue your typical routine. "As a General Surgeon, I spend my working hours standing at an operating table, impossible with crutches…and have been on my iWalk2.0…for nearly six months. This device is one of the most fantastic, original, insightful and important medical innovations of recent years and has allowed me to maintain my job, my family and my sanity despite a nasty injury"
"iWalk2.0 provides many benefits for the patent…early mobilization and helping to decrease loss of both bone density and muscle strength." In September 2013, iWALK2.0 changed the game once more and launched the next generation of hands free crutches – the iWALK2.0 (seen at left). The iWALK2.0 was carefully engineered to be easier to learn, more comfortable and efficient at an even lower price. It includes a host of features including a lateral component on the foot so that this "peg leg" works under the same principles as an actual foot! Everything we've learned about hands free crutches (and we are the industry leader) has been incorporated into this break-through evolution. This revolutionary new product was previewed to the medical community to rave reviews. Orthopedics, Podiatrists, Physical Therapists, Prosthetists can all agree that the iWALK2.0 is a huge step forward (pun intended) in the world of lower leg rehabilitation. We wish that we could help everyone avoid the pain and inconvenience of using crutches, but we can’t. While the iWALK2.0 Hands Free can and does bring new mobility and functionality to the lives of countless people, it does have its limitations. You are in generally good health and prior to your injury you were not challenged by normal ambulatory activities such as walking, climbing stairs, etc. Your injury is to one leg (or foot or ankle) only. You are between 5’0” (152CM) and 6’6” (198cm). 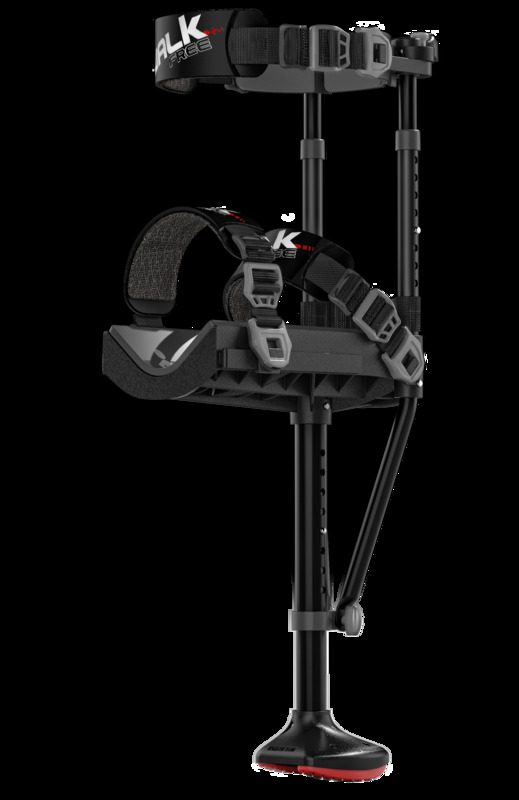 The iWALK2.0 is fully adjustable for a wide range of heights and leg sizes. If you fall outside of this range, iWALK2.0 might still work for you, but contact us for an individual assessment first. You weigh 275 pounds (125 kg) or less and your maximum leg circumference is 27 inches (69 cm) or less (measurement taken as high as possible on the thigh). If you’re wearing a cast, it doesn’t extend beyond half way up your calf. A good quick test to see if the iWALK2.0 might be suitable is to place the shin of the injured leg (with your leg bent 90 degrees) on a padded bench or chair. If you can carry weight in this manner for a few minutes and the shin and knee remain comfortable, this is a good indication that iWALK2.0 will work for you. There are exceptions to the guidelines provided above, so if you fall outside of those listed here, don’t be discouraged – just give us a call so we can discuss your specific circumstances. Typical injuries include (but are not limited to) any sprain, strain, fracture, dislocation or surgery to the lower leg, ankle or foot. Common conditions we experience are sprained ankles, fractures of the lower leg, foot or ankle, Achilles tendon injuries and surgeries, foot surgeries such as bunion or foot ulcer correction. iWALK2.0 is also useful as a gateway device during prosthetic limb transition periods or as a shower / swim prosthetic for users of permanent prosthetic limbs. In short, if you’ve sustained an injury to your lower calf, ankle or foot, and you need to be non-weight bearing, then iWALK2.0 can be used instead of conventional crutches. "On Labor day 2013 I ruptured my Achilles Tendon. Two days later, Ihad a major surgical repair of my tendon. I was given 12 weeks non-weight bearing for my left leg. For the first 2.5 weeks I used crutches and a wheelchair to get around. Before my injury I was a very active person. I worked out 3-4 times a week, ran in a few Warrior Dashes, coached soccer, not to mention all of the daily household activities. Then I ruptured my Achilles and all of my activities came to a complete stop. I could get around on crutches and the wheelchair but that is it - I couldn’t do anything with my hands. It didn’t take long for the depression to start sinking in. My wife and two young boys could tell I was not the happy and energetic husband/father that I once was. I became more and more tired and irritable each day, but then I heard about the iWALK 2.0. Crutch Alternative"
"The night I heard of the iWALK 2.0 I got online and Googled the contraption. When I found out it was only $149.00, it was a no-brainer to give it a try. A couple days later I was assembling the iWALK 2.0 and getting it to fit me just right. Within about 20 minutes I was taking my first steps in nearly 3 weeks. The freedom to walk hands-free and do so many simple things that I used to take for granted is something to cherish. My family could see the difference in my mental state starting that very first day. I was so happy to be able to walk and do things for myself and for my family. I was able to cook dinner that night, help with the cleanup, help get my kids ready for bed and then tuck them in for the first time since the injury. I am back to working out 3-4 times a week, coaching soccer and doing all my daily household activities. The Warrior Dashes will have to wait, but I can do almost anything I want except run. My recovery time will be dramatically less because of the mental and physical help the iWALK 2.0 has provided. I will never be able to describe in words how much the iWALK 2.0 has done for my family and I. It gave me back a life that had been taken away from me. I have been able to go to an NFL game and maneuver the stadium with ease, and I even took my family on a camping trip and set up camp, tent, chairs, food and fire. I can once again go outside and throw the ball with my boys, play laser tag with them and go on an evening walk with my wife, kids and dog as a whole family. The iWALK 2.0 turned a temporarily life changing injury into just a couple months of wearing a really cool looking peg leg. People ask me about it everywhere I go and I never get tired of explaining it to them how great the device works for me. The iWALK 2.0 won’t change your life, it lets you keep the one you always had!" STOP SUFFERING from the pain and inconvenience of conventional crutches! The iWALK2.0 lets you continue you daily routine with little to no interruption. Best of all, you can use your hands! Think of all the things you can’t do when using conventional crutches; preparing a meal, walking your dog, carrying a cup of coffee, pushing a shopping cart. Well, you no longer need to have your life interrupted -­‐ the iWALK2.0 sets you free to resume your day to day routine and enjoy pain free, functional mobility. Stop sitting on the sidelines of your own life because a lower leg injury is impeding your mobility. The iWALK2.0 allows you continue your daily routine with little to no interruption, all while safely letting your lower leg injury heal. If you need to be non weight bearing for any length of time and do not want give up your traditional daily routine, the iWALK2.0 is for you! The iWALK2.0 is a patented FDA and CE Registered Class 1 Medical Device. In essence you kneel on the lower leg platform which bears most of your weight. Through an odd trick of anatomy, you can comfortably kneel on your shin for extended periods without experiencing discomfort or fatigue. The three straps cinch around your leg to stabilize you during standing and walking. Your hands and arms are not involved. So why, again, would you want to use conventional crutches? Adjustment accommodates users from 4' 10" - 6' 6"